Below is a selection of original Celtic artwork created between 1998 and 2006. These paintings were done on paper using acrylic based inks, and are inspired by the early medieval manuscript art of Ireland – a style best know from the Book of Kells. These are all original designs and are created completely by hand, using pencil, paper, ruler and compass – without the aid of a computer. Click on any image to launch the slideshow feature. 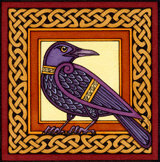 Click HERE to access the Celtic art gallery quality Giclée archival print collection on the Ninth Wave Designs Society6 art print store. Triple Raven – 5″ x 7″, acrylic inks on paper. Samhain – 5″ x 7″, acrylic inks on paper. Ninth Wave – 5″ x 7″, acrylic inks on paper. High Cross – 5″ x 7″, acrylic inks on paper. Beltane – 5″ x 7″, acrylic inks on paper. Horsehead Spiral – 5″ x 7″, acrylic inks on paper. Cross Carpet Page – 5″ x 7″, acrylic inks on paper. Fox Dance – 9″ x 12″, acrylic inks on paper. Knotwork Shield – 10″ x 10″, acrylic inks on paper. Dragon Shield – 10″ x 10″, acrylic inks on paper. Ninth Wave Shield – 10″ x 10″, acrylic inks on paper. Galicia Shield – 10″ x 10″, acrylic inks on paper. Children of Lir – 7″ x 7″, acrylic inks on paper. St. Patrick – 5″ x 7.5″, acrylic inks on paper. Deep Peace – 5″ x 7″, acrylic inks on paper.